My brother, Jonah, and I just want to TALK to the magic mirror -- we're not planning on traveling into any fairytales today. Promise. Except we do wind up going through the mirror, this time into the story of The Frog Prince. The princess, who's supposed to transform the cute little frog back into a handsome prince, turns out to be super rude. Jonah and I decide we don't want -- or need -- her help. We can take matters into our own hands and turn the frog into a prince ourselves! Can't we? 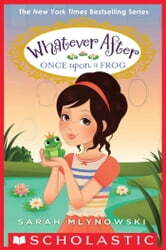 Now we just have to: - Climb out of a smelly well - Canoe over a waterfall - Sneak into a palace - Kiss a frog (ack)! And there's no time to waste -- let's hop to it! Ever wonder what actually happened to Snow White or any fairy tale charactors? Then this book is for you! Princess Coco has gone loco! I would puke if I had to kiss a FROG! Why does Jonah have a spiderman watch? Spiderman's a hero. Jonah, on the other hand, likes to throw frogs at trees. Tsk, tsk, tsk, Jonah. Very fun, creative and enteraining read for youth. the only problem is having to put it down. No cool twists on the fairy tales, and really mlynowski? a spoiled brat of a princess? gimme a break! i have heard that billions of times! if you want a good book, you need an originAl idea.